Last night I found my old hand held LCD games and was reminded of how much fun they are. I put a couple of batteries I had in them, but they didn’t last long as they must be flat. We got these games in the 80’s and were the primary means of entertainment when bored on long car trips, living out in regional NSW meant many of those. These little hand-held games had many advantages: the batteries generally lasted a long time, they were relatively low cost, and the games could be replayed many times. I remember sitting in the back of the car competing with my brothers for high scores on the ones we had. I had two games, one called Soccer and another called Space Castle. Both games were obviously very simple, Soccer had you playing as a goalie catching soccer balls that would be kicked at you by a number of players in the field. You had to be fast as frequently many balls would arrive at nearly the same time. Space Castle had you flying a space ship through a pile of obstacles to a landing pad. Both games would speed up as you played getting harder and harder, you could tell the change in pace by the ticking sound many LCD games made as they played. Soccer fortunately would slow down to a lower level once you’d beaten the fastest speed, only to later speed up again, whilst other games would just speed up until it became unplayable. My older brother had a few of these games as well, Mickey and Donald and Pacman that I remember. Pacman unfortunately got broken, and as it was a seemingly rare game I’ve not seen one since. Mickey and Donald also seems to be rare, but there are some simulators on-line that let you play. I think we might still have this one, but I haven’t seen it in years. If you’re looking for a simulator to play these games there are a few places to look. Madrigal Design has a number of them, as does hand-held remakes. If you want to play in your browser pica-pic has a number of games you can play there, including the rare Mickey and Donald. It’s nice to know that people are preserving these and creating simulators so that others may play them and get a feel for what they are like. This is one form of old-school gaming that could easily disappear, as everything is in hardware and knowledge of the internals long since lost. Tape is probably one of the older mediums for storing data, both for computers and in general. Anyone who grew up in the 80’s will remember the humble audio tape. In my family we all got our own radio combined with a tape player in our early teens, mostly so we could listen to music. We bought ourselves blank tapes and would record music from the radio which was a common practise at the time. Early micro computers made use of audio tape, mostly because it was cheap and very common. They encoded in audio waveforms in a similar way that modems did later for telephone lines. The disadvantage was that they were incredibly slow, and had to be wound to the start of the program each time to load it. It was very time-consuming! However many collectors have found recently that audio tape has retained more of its reliability over time compared to floppies. Tape storage didn’t end or begin with the micros however. 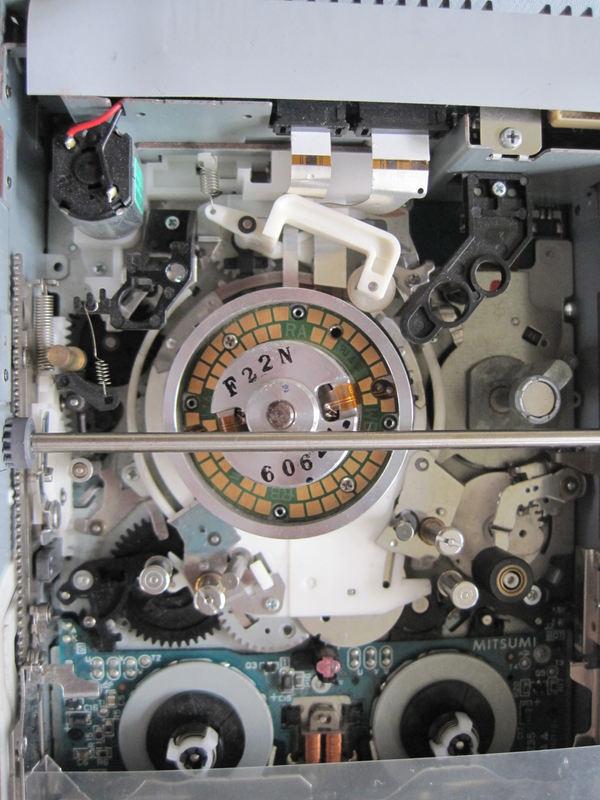 It was used for many years before in the mainframe world in the form of large reel-to-reel tape drives, where it proved its reliability and storage capacity was superior compared to other storage. People moved away from using large expensive machines such as these so it became important to develop backup and storage solutions for smaller personal machine such as the IBM PC. From here tape drives became an important storage medium for long-term storage of data, distribution of large data sets, and backup copies. It was even used by many Unix workstation suppliers to distribute their operating systems! Here I have a small collection of tape drives that I’ve accumulated over time. The left hand drive is the newest being an Exabyte Eliant 820 which uses 8mm tape that I think was also used in some camcorders. 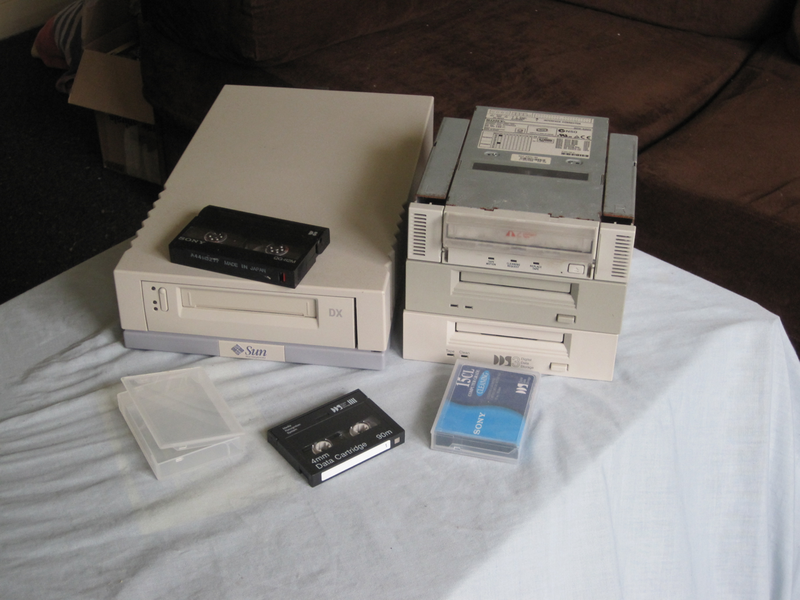 The drive at the top right is an AIT 2 drive which used similar cassettes but a different grade of media. The two remaining drives are DDS drives which are one of the older standards. They used 4mm tapes, I have a cleaning tape and data tape on the table in the foreground. All of these drives used the same technique to store data as VHS. This picture will look very familiar to anyone who has dis-assembled their VCR. You can see the rotating drum that houses the read/write heads. One difference between this drive (the AIT 2) and VHS is that this drive does not have the linear head for erasing or audio. Otherwise it is pretty much a scaled down version of VHS. Here is an overview of one of the DDS drives. You’ll notice it is very similar to the AIT drive in its features, just scaled down for the smaller size tapes. Although I did notice the strange wheel inside the drive, I assume it’s for cleaning, although a cleaning tape is usually used for that purpose so I’m unsure of this. 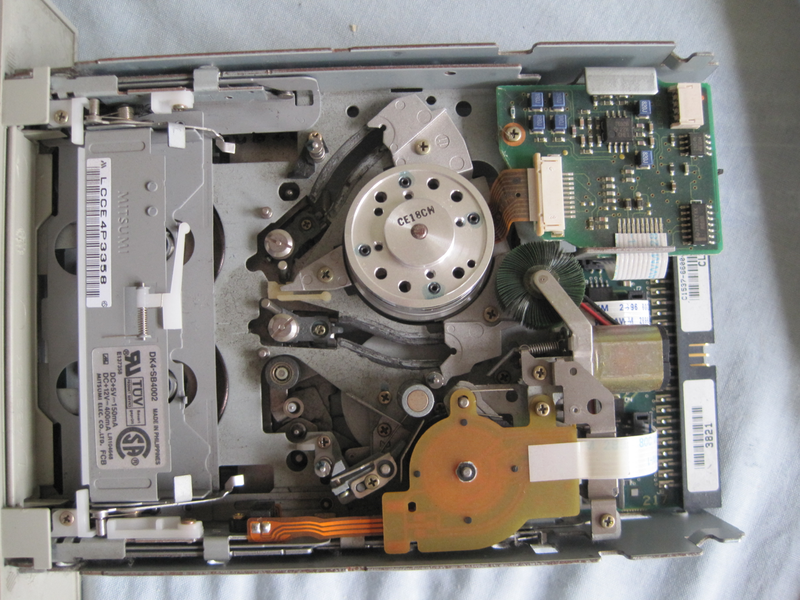 Here I’ve inserted a tape to show the path the tape goes through this drive. Again it’s almost identical to the path tapes would take through a VHS machine. It doesn’t appear to have the capstan and roller found in audio tape players and VHS. Unfortunately I don’t have an LTO drive, as they have some of the most interesting internals I have come across. 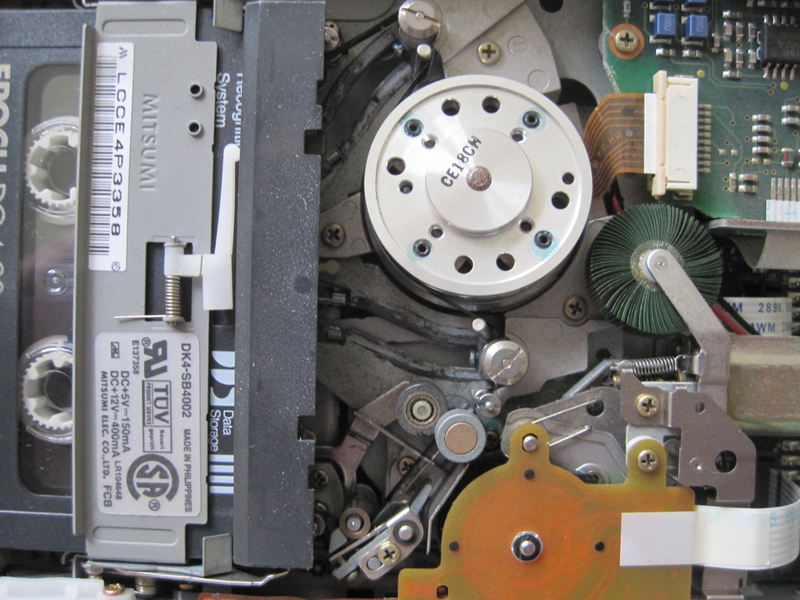 Unlike other tape systems the cassette has only one reel in it. 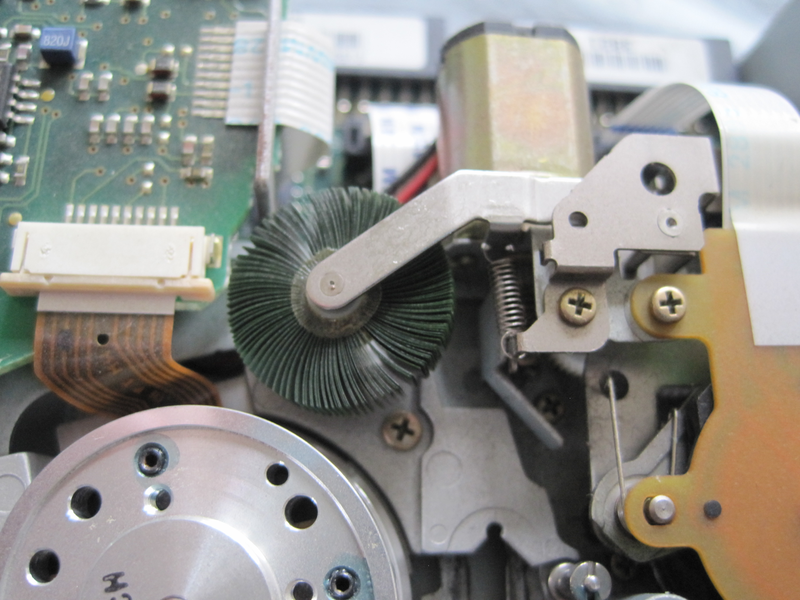 The tape engages a mechanism inside the drive to pull the leader through to a second reel permanently stored in the back of the drive. The heads are then engaged when the leader has wound onto the take-up reel. This is part of the reason LTO drives are quite large compared to other types. These drives can store up to 2.5 Terabytes per tape with the newer drives. Finally, storage of a different form. I recently bought a book that has 101 games written in BASIC from the late 70’s. Reading its pages is like looking back in time to the days when people used time sharing systems and simple micro computers to play simple games such as these. Frequently these games were distributed in print form, and users had to type them into their machine, making modifications for their machine as they went. You can find an archive of the games themselves here, but I found the book was nice to have because of the illustrations and descriptions of the games. I used to work as a computer hardware technician in my days working in IT support for a local company. One of the things I frequently did was repair/service laptops of various types, I got quite practiced at it. Recently I put my skills to use as my partners old Medion laptop needed a new hard disk, upon inspecting it I found it was in bad need of servicing as the machine overheated badly. When disassembling a laptop it’s important to have the right tools, otherwise you’ll damage electronic components, plastic parts, or simply be unable to complete the job. Screw drivers are important and I have a couple of good sets of screw drivers, including torx. I have a kit that uses hex shaped bits with many shapes of each type of bit, this is helpful when your fixed screw driver can’t quite fit the screw head properly. I don’t have an anti-static mat at the moment, but it is advisable to have one, if you don’t you can touch something earthed, but it’s not ideal. You can sometimes use a flat head screw driver for separating some parts of the chassis, but I wouldn’t recommend it if you can get a plastic spudger (or even a metal one). Using one for prying the case open when required usually results in less cosmetic damage and fewer broken clips. Finally you should be prepared for replacing the thermal paste for the CPU/GPU, many designs make it impossible to clean dust out of the heat sink without removing it entirely. What I have here is pretty standard for replacing thermal paste, some isopropyl wipes and thermal paste (not pictured). The wipes are much better at cleaning up the old paste than anything else I’ve used, even if it’s hardened. Always clean the old paste off before putting new stuff on.